With an aging population and increasing health care costs, health care providers are looking for ways to provide high-quality care without having patients occupying expensive hospital beds or making repeated trips to the doctor’s office. Providing health care remotely — teleheath — is a booming industry that was created to solve this problem. LiveSwitch allows health care providers to interact and share voice, video, chat and diagnostic data among patients and other health care providers anywhere. Whether providing e-visits, physician-assisted nursing or emergency services – using modern audio/video communications in combination with medical devices that collect real-time diagnostic information such as heartbeat, blood pressure and more is the future of health care. 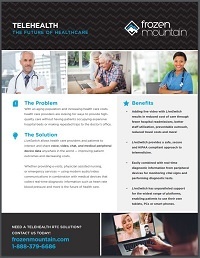 Frozen Mountain’s LiveSwitch provides the key Internet-Based Real-Time Communications (iRTC) components required for health organizations to flexibly incorporate audio, video, chat and diagnostic data to deliver a telehealth platform that is functional, fast and can be tailored to meet specific healthcare needs. Data transmission using traditional health care networks is proprietary and very expensive to use. By using the Internet as a backbone, our products use an Internet of Things (IoT) approach where Internet transmission is combined with standard devices, such as tablets, smartphones and many wearable devices. This provides a safe, secure, HIPAA compliant approach to health care data exchange among home patients, doctor’s offices and hospitals. 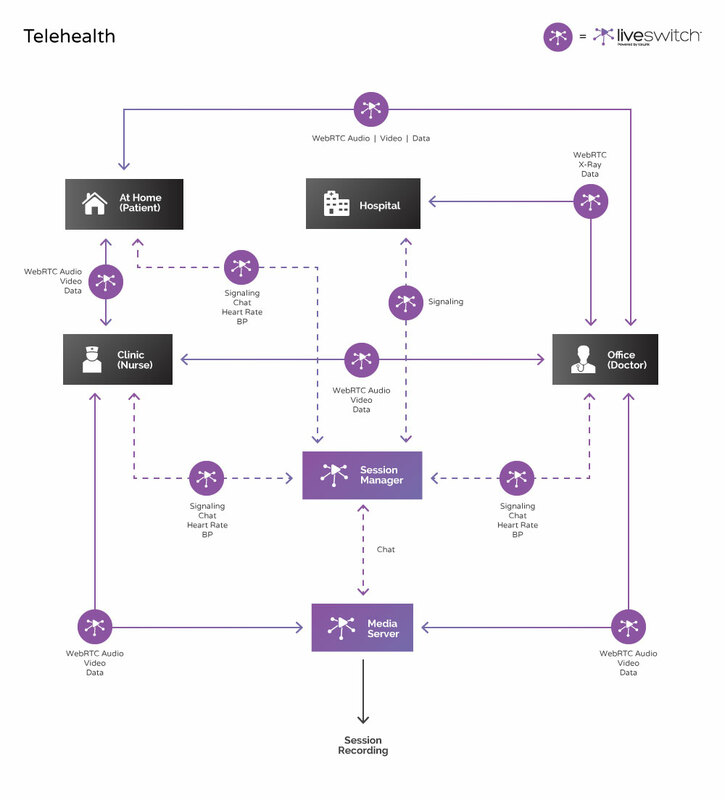 The following diagram is an example of how LiveSwitch could be used in a telehealth situation. Contact us to discover how our RTC expertise can put you at the forefront of telehealth delivery. Over 35 companies worldwide rely on Frozen Mountain to develop their telehealth solutions and products. Contact us to see how you can also use Frozen Mountain's RTC products and services to be at the forefront of telehealth delivery.